Lasagna has a new place at the dinner table this summer. It’s a memorable recipe for entertaining; this alfresco version cooks in foil packets on the grill! Round out the special meal with a side salad and cheesy garlic bread. Look for the Proudly Wisconsin Badge when shopping for cheese. Any brand of Wisconsin Cheddar, Fresh Mozzarella or Young Cheddar can be used in this recipe. Brown sausage in a large skillet over medium-high heat until no longer pink. Remove sausage to a paper towel to drain. Place 1 noodle onto four greased pieces of double thickness aluminum foil, each about 16 x 12-inches. Drizzle each noodle with 1 tablespoon water. Layer each with 2 slices mozzarella, salt, pepper and 1/4 teaspoon red pepper flakes. Sprinkle each with an eighth of the sausage, 1/4 cup tomatoes, 1/2 cup spinach and 1/4 cup cheddar. Season with salt and pepper. Repeat layers. Top with remaining noodle; drizzle each with 1 tablespoon water. Sprinkle with remaining cheddar. Fold foil into packets and seal tightly. Grill, covered, over medium-high heat for 10 minutes. Flip packet; grill, covered, for 10-15 minutes longer or until noodles are tender. Meanwhile, combine the remaining tomatoes, basil and olive oil in a small bowl. Season with salt and pepper to taste. Remove foil packets from the grill. Let stand for 5 minutes. Take care when opening the foil; allow the steam to escape. Serve lasagna with tomato salsa. Any brand of Wisconsin tomato basil cheddar cheese can be used. 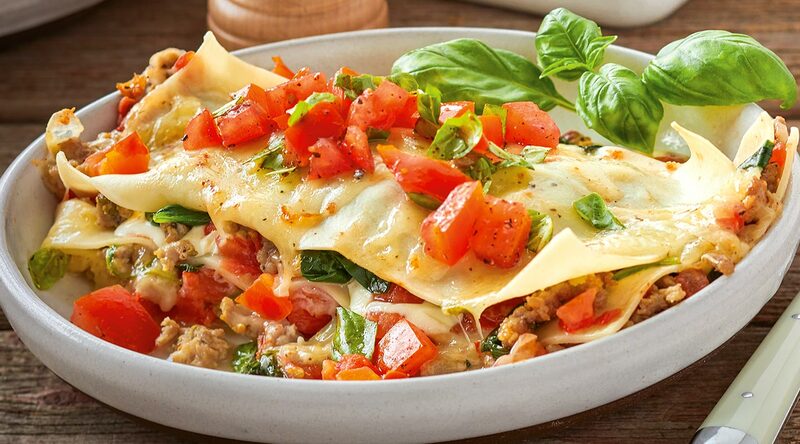 We tried this recipe with Barilla Oven-Ready Lasagna noodles. The size of each noodle was approximately 7 x 3 1/2-inches. To bake the foil packets: Prepare the recipe as directed. Bake at 400˚F for 20-25 minutes or until noodles are tender. Do you have questions when shopping for cheese? Ask the cheesemonger! A cheesemonger specializes in the buying and selling of high-quality cheese, usually available in the specialty section of a grocery store or cheese shop. Knowledgeable and passionate, a cheesemonger is a go-to resource for cheese varieties and pairings, proper cheese storage and handling, its cooking applications and cheese brand information. Henning’s Tomato Basil Cheddar cheese has won Best of Class in the U.S. Championship Cheese Contest! White cheddar cheese blended with tomato and basil; it is also delicious served sliced in sandwiches, on a cheese board for snacking and sprinkled in Italian dishes.